For fighter info, see Greninja (SSB4) and Greninja (SSBU). 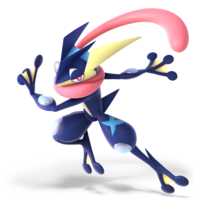 Official artwork of Greninja from Pokémon X and Y.
Greninja (ゲッコウガ, Gekkouga) is a fictional creature from the Pokémon series. It debuted in the series' sixth generation as the final stage Water-type starter Pokémon of Kalos, and represents that generation as a playable character in Super Smash Bros. 4 and Super Smash Bros. Ultimate. 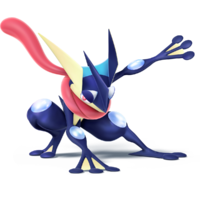 Greninja is a bipedal, frog Pokémon, and is categorized within the Pokédex at #658 as the "Ninja Pokémon". 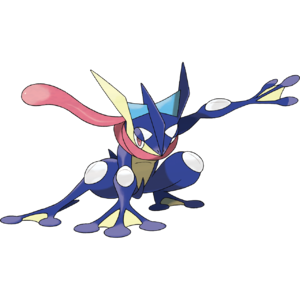 Greninja is a dual Water/Dark-type Pokémon and the final evolved form of the starter Pokémon Froakie, after having evolved from Frogadier at level 36 onward. As Froakie, it is one of the Kalos region's three starter Pokémon. According to the Pokédex and based on its statistics in the Pokémon games, Greninja is extremely fast, to the point that it has the highest raw speed statistic of any Water-type Pokémon or fully evolved starter Pokémon. Fittingly, it relies on this speed in battle to confound its prey with swift, ninja-like grace before striking with its Water Shuriken move, which is said to be able to shear metal. In exchange, however, it is rather frail because of its low defenses. In the Pokémon games, Greninja has access to numerous unique abilities. In addition to Water Shuriken, which it uses in Super Smash Bros., it was the only Pokémon able to learn Mat Block, where it flips a tatami mat in front of itself to shield itself and its allies from incoming attacks. In addition to these two unique moves, it has access to a diverse range of offensive and status moves; it can even uniquely take advantage of them with its rare Hidden Ability Protean, which changes its type to match each move it uses and ensures it gets the maximum possible power out of every attack. Its prowess in Pokémon battles courtesy of Protean has led to Greninja to being considered an extremely powerful and useful Pokémon by the competitive Pokémon scene, to the point that is even viewed as an "Uber-tier" Pokémon in the same vein as Mewtwo. In Pokémon Sun and Moon, Greninja appears as a gift Pokémon obtainable via the games' demo version. This Greninja has the unique Battle Bond ability, which allows it to transform into its more powerful "Ash-Greninja" form, which initially debuted in the Pokémon anime. Greninja has made multiple appearances in the Pokémon anime, but is most notable for being Ash Ketchum's ace Pokémon during the XY series. Having been part of Ash's party ever since Ash received it from Professor Sycamore, the Pokémon developed a close bond with Ash throughout the series as it trained and evolved, eventually gaining access to its strengthened "Ash-Greninja" form because of the connection between Pokémon and Trainer. With the help of Greninja and the rest of his Pokémon team, Ash was able to achieve his greatest success in a Pokémon League tournament up to that point, only losing in the finals due to Greninja being overwhelmed and defeated by Alain's Charizard. At the end of the series, Greninja bade farewell to Ash, parting ways in order to help protect Kalos alongside two Zygarde, Squishy and Z2. Greninja, as it appears in Super Smash Bros. 4. Greninja debuts as a newcomer in Super Smash Bros. 4. It was first revealed in the Super Smash Bros. Direct on April 8, 2014, alongside fellow Pokémon representative Charizard. Much like in its home series, Greninja is very quick and mobile, similarly to Sheik and Sonic. However, it possesses more consistent KO power overall in comparison to them. It also possesses special moves that can catch opponents off-guard, such as Shadow Sneak and Substitute. Greninja is currently ranked 26th out of 55 on the tier list, placing it in the C tier. Greninja's strengths include very fast overall mobility and great combo potential, most notably with its neutral attack's jab cancel, and its up and down tilts. Water Shuriken also grants it a decent projectile, which not only has fairly good travel distance, but is also capable of being thrown out for a fast attack, or charged up for greater power. Despite these positives, Greninja has a few noticeable negatives. It has unusually high ending lag in its moveset, especially its smash attacks. Substitute is a weak and avoidable counterattack. Lastly, its grab game is burdened with an abysmal pummel, an overall low damage output, and only two throws whose utility is decent at best. Regardless of these issues, as well as being noticeably nerfed in update 1.0.4, Greninja is still viewed as a viable choice for competitive play, thanks to it achieving decent results. Greninja, as it appears in Super Smash Bros. Ultimate. Greninja returns as a playable character in Super Smash Bros. Ultimate. Unlike in SSB4, it is an unlockable character instead of a starter. Two of the most notable changes are that its water katanas have been replaced with water kunais, and that its Final Smash now features its Ash-Greninja form introduced in the anime and featured in Pokémon Sun and Moon. Masahiro Sakurai decided to add Greninja to Super Smash Bros. 4 long before the release of Pokémon X and Y, having initially reserved a space on the roster for a brand new Pokémon. Sakurai's only source material for designing the character was concept art of Greninja. Because of this, Greninja's depiction in SSB4 is not directly based on a particular member of its species in the anime, unlike all other playable Pokémon in the game. However, it shares its voice actors in various languages with Ash's Greninja (which was unevolved at the time) and Riot's Greninja. In Ultimate, Greninja uses water kunai in place of water katanas, much like Ash's Greninja. Greninja also now transforms into the Ash-Greninja form during its Final Smash, Secret Ninja Attack. Prior to Corrin's appearance as downloadable content, Greninja was the most recently debuted playable character at the time of SSB4's release. Greninja, Roy, Lucas, Dark Pit, and Incineroar are the only characters to have never appeared on a home console outside of the Super Smash Bros. series. ↑ Siliconera: "All The Super Smash Bros. Characters Were Decided Upon Early In Development"
This page was last edited on April 12, 2019, at 15:16.